Experiencing property damage is a stressful situation to deal with but having insurance coverage can help make things a little easier for you. Insurance will cover repair and restoration costs to address the damage that your property has suffered; however, for such costs to be covered, you need to know about insurance claims and how to file a claim. Insurance claims for water damage are the most common type of claim that gets filed. Such a fact is sensible considering the commonality of water damage. Homes can suffer water damage from natural sources like flooding or from non-natural sources like appliance malfunctions. Regardless of what sourced the damage, if your property has water damage, you need to contact your insurance provider and be prepared with your policy number. Consider the following tips when filing an insurance claim for water damage. Review your insurance policy to make sure that water damage is covered within it and to find out what exactly it covers. If you find that not all of the aforementioned is included in your plan, inquire about additional coverage. Your damaged belongings can only be reimbursed if you create a detailed inventory of what has been ruined. Include details like each damaged item’s make and model, condition, age, cash value, and replacement cost. Remember that replacement cost differs from market value, though. Your insurance will cover the estimated cost of repairs for the damaged contents, taking away depreciation. If you so desire, you can also take pictures of the damage as further evidence. You will need evidence to make claims to your insurance company, so damaged property must be available to be inspected. Don’t dispose of anything until your insurance company allows it per a written statement. If you do throw away stuff, then you may not get coverage for such items. Any reconstruction that is done prior to your insurer’s approval might not be covered, so you aren’t advised to conduct any. You can, however, conduct emergency repairs needed to safeguard your home from further damage. You just need receipts and proof for such temporary work. When you contact your insurance about the damage, the company will advise you to work with their particular services, vendors, and property restoration contractors. But you don’t have to. Conduct research on different services, get estimates from different companies, and use the services that are best for your needs. After reviewing coverage, gathering thorough evidence, and making an inventory list of damaged content, the next step to take is to write a notice for your insurance company for the official insurance claim. This notice should include background context, details of the damage, and any other relevant information. Your insurance provider should get in contact with you within one to two days. The company will explain the claims process and let you know what actions you’re responsible for. Your insurance provider has 15 business days to either accept your claim or reject it. If they accept it, then they will pay the claim, and you should get your money within five business days. If they deny your claim, then this denial needs to be explained in writing. An adjuster will be sent to your home to conduct an inspection of the damage it has suffered. The adjuster could be employed full-time by your insurance company, an independent contractor who works with various insurance companies, or a public adjuster who works for you. Public adjusters offer the best chance for success with insurance claims, because this person takes care of claims in their entirety. Regardless of such details, the important thing concerning the adjuster is that he/she is a licensed professional. You will want to be at home for the adjuster’s visit so that you discuss the damage and have any questions and concerns addressed. Your insurer lets you know through a written notice if your policy covers the damage, and this notice will include an estimate of the damage repair costs. You will get a check for this within five business days. If you do not get the check within this time frame, call your insurance company and follow up with them. For those with a replacement cost policy, you will get paid to conduct the repairs on your home. The payment amount will be based on costs, but the check amount will be based on an estimated cost with depreciation and deductible costs subtracted. However, be aware that such repairs will need to be done within a certain time frame. With actual cash value coverage, you will be reimbursed for actual restoration costs minus depreciation. This amount usually isn’t sufficient for thorough restoration, but you might be able to increase your coverage by purchasing an endorsement. It is essential to know that your insurance policy only covers material of the same quality as what has been damaged. If you want any upgrades for any materials, these costs must be covered by you. Normal policies usually don’t address mold remediation unless it is needed to conduct repairs. Sometimes policies have limited coverage for mold, and sometimes you can buy more coverage to have mold included. Mold can develop in response to the water damage and will spread quickly, which makes it important to address any water damage immediately. Water needs to be extracted, and your property and any affected materials must be dried as soon as possible to limit the amount of damage sustained. Mop up or blot pools of water to remove them from your property. Wipe down wet wooden furniture and take wet upholstery and rugs outside to air dry. Additionally, make sure you get certificates from your mold remediation company for any repairs and restoration that’s performed to ensure coverage from your insurance. If your insurance provider has rejected your claim or if you are unsatisfied with it, then contact your insurance provider about this. Oftentimes, you can fix these issues just by talking it through. But if you can’t, then you should file a written complaint. Related Article: What To Do When Your Water Damage Claim Gets Denied? After your insurer has accepted your claim, hire a professional water damage restoration service provider. 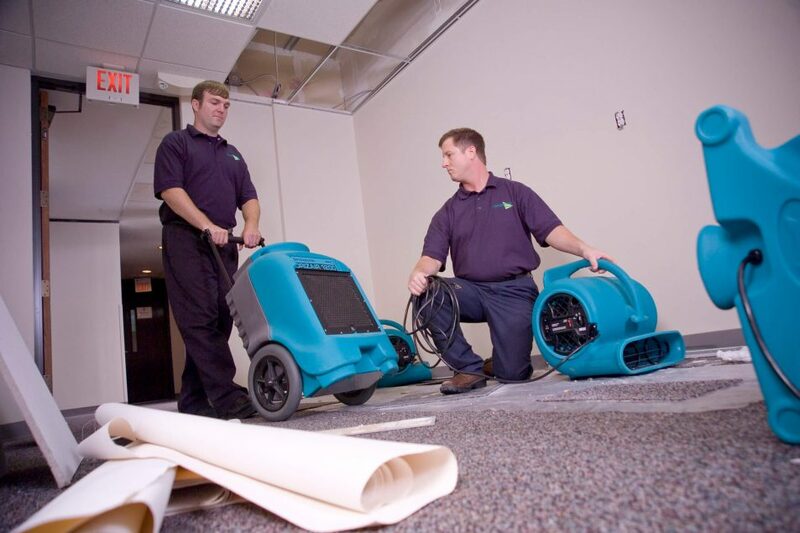 Water damage spreads, worsens with time, and can become permanent. Knowing this, it is important to get immediate help so that the damage is limited. Professionals will remove excess water, dry out your property, make repairs, eliminate mold, and clean and deodorize your property. When the job is completed, and you are satisfied with the service, have the final bill sent to your insurance company. If your home has suffered enough damage, then you will need to move out during the ongoing restoration process. If your water damage insurance policy includes it, your insurer will pay for your housing, living expenses, food, and other necessities. It is recommended that you use companies who will directly bill your insurer instead of billing you. Be sure to keep receipts and a record of everything you have purchased. Not all living costs and other expenses will necessarily be covered by your insurance, though. Make sure you know what is covered and how much coverage is provided. That way, you don’t exhaust the amount too quickly. If you do, you will be left to pay for such expenses. When your property gets restored and you are reimbursed for the service, be mindful, and do what you can to limit the potential for water damage. You do not want to have to deal with the stress that such a claims or restoration process presents again. If your property has sustained water damage, act quickly to file a water damage insurance claim. Doing this lets you get help from a water damage restoration company sooner, which is important in preventing further damage from happening. 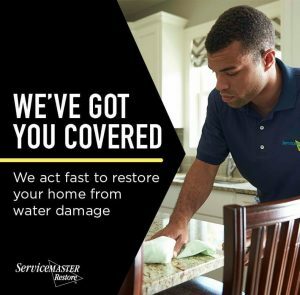 With professional water damage restoration services from ServiceMaster by Restoration Contractors, your property will be thoroughly restored. Our professional technicians will work to contain the damage, dry out your property’s structure, make repairs, eliminate mold, and sanitize the affected areas.